Galtymore stands at 919 Meters. It forms the highest point in County Limerick and Tipperary. My walk, following the Black Road and taking in Galtybeg took just under 3 hours. I walked up Galtymore on Saturday 27th of November. This was a day with ‘Turn Back Now’ written all over it, from the light snowfall that almost prevented my half-six departure from the house to the blizzard conditions I encountered on the M7 as I headed out from Dublin. I considered going home and back to bed several times, but figured there was so much snow on the road that I wouldn’t make it up the off-ramp to change direction. You see, this was the first day of Ireland’s second Big Freeze of 2010 and there was plenty of snow forecast for the east of the country over coming days. I drove on, deciding that if conditions didn’t improve by 9 am I would indeed go home, but the snow stopped falling shortly before I hit the M8 and the temperature rose to a relatively balmy zero degrees. While researching Galtymore I had decided and planned to walk from the Glen of Aherlow side, taking in Cush, Galtybeg, Galtymore and Slievecushnabinnia over a 5 to 6 hour period. With the sun going down at 4pm and no company for the day I left home early in order to have a good cushion of time in hand. With an eye on the weather forecast I also looked into the route that follows The Black Road which can be accessed from the old N8 and is by all accounts the more straightforward option aka the Tourist Route. By the time my car emerged from the 60 km crawl that was the snow bound M7 I had decided that the Black Road sounded like the safer option, in hindsight a wise move as the conditions were to prove to be highly challenging. The turn for the Black Road is found about 16 kms from Cahir along the old N8 towards Cork. It’s on your right shortly after passing under the new M8 and is signposted with a brown ‘Galtymore Walk’ sign. From here a 3.5 k drive brings you to the end of the road where there is space for 4 or 5 cars to park. From this point you follow the path through two gates on into open hillside, gradually ascending and skirting around Knockeenatoung which is on your right. Galtymore and Galtybeg will now be ahead and to your left. Keep following the path until a cairn marks the point where it continues straight ahead while a second branch goes left. Follow this left branch and start climbing for the col between Galtymore and Galtybeg. All these directions are theoretical because I could only see about 15 feet in any direction due to a strong wind, cloud and light snowfall. I was following the Black Road, admiring the red sandstone beneath my feet and occasionally hearing the voices of unseen people up ahead. Soon after leaving the fork in the path and starting into the near frozen grass of the hillside I caught up with a guy and a girl, Jerome and Deirdre, who were mock fighting with some of the massive icicles that had formed on the edges of the peat hags. We stopped to chat and agreed the weather was horrible. We also learned that Deirdre knew the hills well but they didn’t have a map, while I had a map but didn’t know the area. We struck a deal to push on together for a few more minutes and see how we felt when we reached the col.
As we pushed on into the cloud up the steep hillside we eventually came to a point where there were only some rocks and the rushing sound of wind above us. Sticking our heads between a gap in the rocks we discovered that we were actually on the top of Galtybeg and had climbed higher than we needed to. At this point Jerome and Deirdre were thinking about heading down, but I urged them to carry on for a few more minutes. I didn’t want to carry on alone…and they didn’t have a map 🙂 Thankfully they were happy to keep going so we pushed on into the white and descended towards the col, with the wind and snow increasing all the while. Soon we were walking along the northern edge, aware of the severe drop off and lake below, but unable to see more than a few feet down. Then it was up and up towards the summit of Galtymore in a seemingly endless climb. It probably only took 15 or 20 minutes but when you can’t see the end of such a climb it seems to go on for ages. And yes, I know we could have huddled up and consulted the map, calculating the distance and counting the contours, but by this stage we had icicles in our eyebrows and the wind was making us stumble into each other so we just soldiered on. On the way we passed three guys looking very well kitted out in full black North Face winter gear. T’was comforting to know we weren’t the only lunatics out in those conditions. We decided to fully retrace our steps rather than cutting off for the Black Road at the col, so we ascended again to Galtybeg before dropping back through the slot in the rocks and out of the wind. What happened next? About ten minutes later the clouds lifted and we saw the Black Road again and in the distance the snow dusted Knockmealdowns. Ten more minutes saw us back on the path and looking back to see the first signs of clearing up on the hills we had just come from. The forecasted blue skies for this part of the country had arrived. Gah! If I hadn’t left home so bloody early I would have wound up with clear weather and great pictures from my walk. 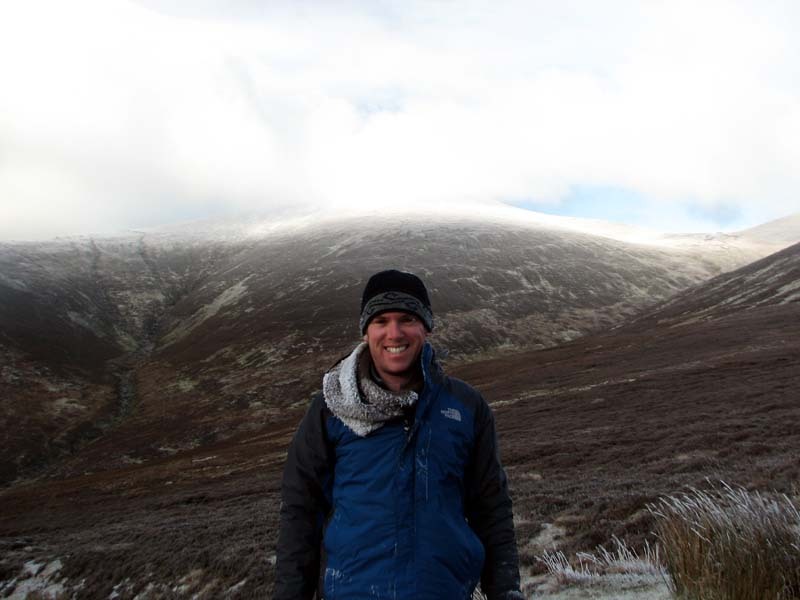 On the other hand, I was under pressure to reach the top of Galtymore on that particular day as I still need to reach the top of Knockboy in Cork and Carauntoohill in Kerry, and I was also aware of the snowy weather that was due to settle over Ireland. [Note, it did settle, and the whole country pretty much shut down for a couple of days] So, all in all I was delighted to reach the top and to have met Jerome and Deirdre, without whom I would have certainly had to turn back. The conditions were the worst any of us had ever experienced on the hills which only added to the pleasure of getting the job done. Galtymore - looking all innocent. After saying goodbye to Deirdre and Jerome I rolled back down the hill, stopping for a warm up and a coffee in the very cosy Kilcoran Lodge hotel, a place I had often passed on drives down to Cork but never visited. Drop in…they probably need the business now that the motorway has opened. At only two hours drive from Dublin and 50 minutes or so from Cork these hills are a great option for a day out. I’d really like to return and do the circular walk that is linked below. 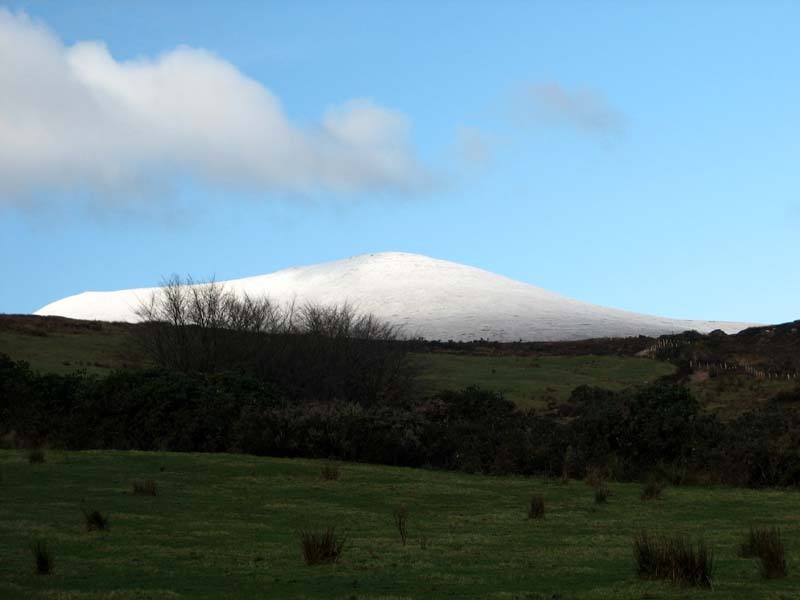 As I mentioned, I had planned to do what I suspect would be a brilliant circular walk in the Galtees that departs from Clydagh Bridge in the Glen of Aherlow and takes in several peaks such as Cush and Slievecushnabinnia before returning you tired and satisfied to your car. I understand it’s a tough walk so do your homework in advance. Here’s a more detailed description of the Black Road route up Galtymore that I took (or should have taken if I was navigating more carefully). Mapwise, you will need sheet 74. This map also covers the Knockmealdowns which form the high point of Waterford. So, go for it. Take a walk up those wonderful hills too! I leaved not far from there as a child and it was a common walk for us. Thank you for reminding me of the beautiful views. It will be on my must do list for next year.